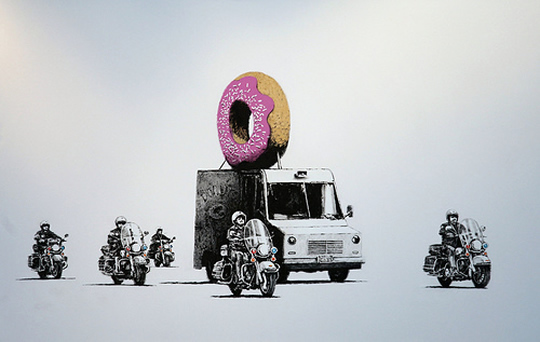 The gallery Pictures on Walls has just made available 30 x 22 inch prints of Banksy's "Donuts," which recently debuted at his Bristol City Museum exhibit. 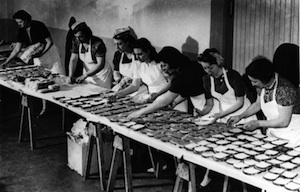 Only 598 copies are available — 299 each of chocolate and strawberry flavors — through a lottery that runs through Tuesday at noon. Whether you're a cop who'll do anything to guard his snack of choice, or a food truck vendor tired of being harassed, you might just get the privilege of paying £465 (~$760) for a print. That is probably the best donut art I've seen in a while, I'd buy it in a heartbeat if it wasn't so expensive. It's got that snazzy Simpsons-meets-1984 vibe.